I am interrupting my regularly-scheduled blog posts because I want to share this with you. Because I’m thinking you might want to see something refreshing and sweet instead of a practical dish that we’re all wont to prepare on Monday nights. Because I am feeling extremely thankful for my imperfect life and a chicken dish, albeit delicious, just wouldn’t convey this mood as adequately as chocolate would. Because a few of you have given me even more reasons to smile (more on this later), I made this for you. 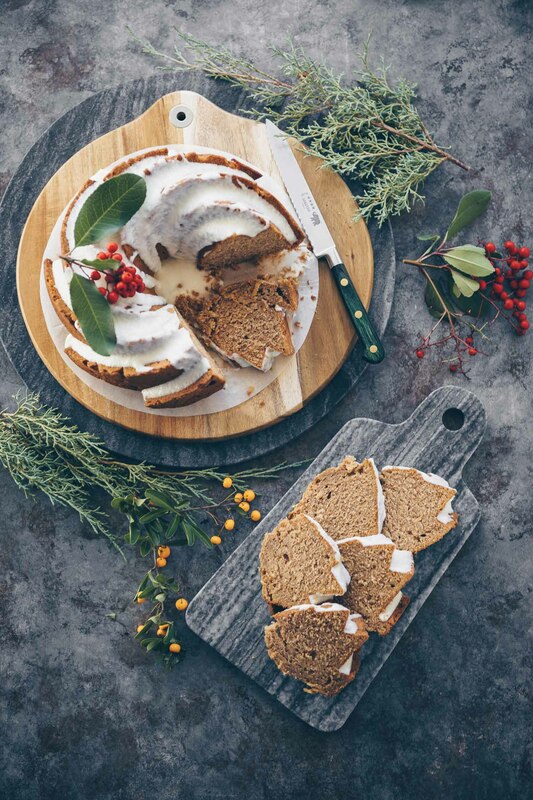 Yes, I get to eat it and not you, but I’ll share the recipe below so you, too, can see why I’ve chosen this treat for tonight. Blogging about new recipes these last few months has taught me one thing I hadn’t realized before: My taste buds are fickle. I’ve always been able to quickly name my favorite foods, without hesitation, without question. Lately, however, I feel like I’ve been using the word “favorite” too loosely because I’ve been attaching it to so many new dishes. Take sorbets, for example. A couple of weeks ago this cantaloupe sorbet was my favorite, but after making this bittersweet chocolate version, it’s my new favorite. Does this happen to you? I blame this on Dorie Greenspan and Pierre Hermé. Remember the Nutella Tart I posted recently? I enjoyed it so much that I’ve flagged almost all of the recipes in this book. A mere three ingredients are required: Bittersweet chocolate, sugar and water. The mingling of these three created such a rich and silky chocolate treat that I was hooked immediately. The depth of flavor was surprising for a sorbet. It was like eating a frozen chocolate bar (Valrhona in this case) with the added bonus of being refreshing, cool and smooth. No other flavors interfered with the natural goodness of the chocolate. I’d say it was perfect. It’s special. It’s my new favorite sorbet. 1. Prepare an ice-water bath in a large bowl that will hold your smaller bowl containing the sorbet mixture. You will need this to quickly chill the mixture before you churn it. 2. Combine all the ingredients in saucepan and cook over low heat, stirring frequently until the mixture boils. This can take up to 10 minutes or more. When it boils, stir constantly and allow to boil for two minutes. Pour the mixture in a smaller bowl and set in the ice-water bath. Allow the mixture to chill, stirring occasionally. 3. Freeze the sorbet in your ice cream maker according to the manufacturer’s instructions. You can serve immediately or pack it into an airtight container and freeze. This will make a pint (1/2 liter). Last month, Amanda of The Cilantropist generously included me in her list of Beautiful Bloggers. She described my blog as being like her own for our similar thoughts about food and I was very flattered. 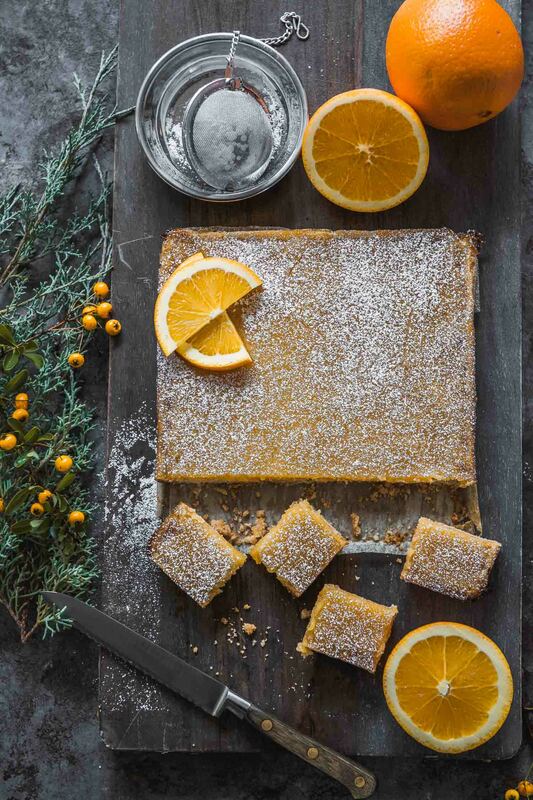 Even without the beautiful images or the delicious recipes she gives her readers, her sunny personality shining through her every post is enough to win anyone over. 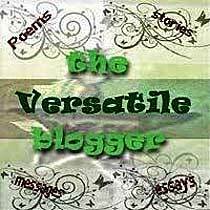 Have a look at her blog and see for yourself. Next, Stephanie of Per l’Amore del Cibo passed on the Sunshine Award to me last week. 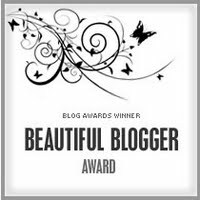 What an honor for a new blogger, especially since I’m receiving this award for the second time! I’ve enjoyed Stephanie sharing her adventures in the kitchen and I admire her for having the courage (that I haven’t mustered myself) to make French macarons as part of the Daring Baker’s Challenge. She’s just reached an important milestone, her 1 year blog anniversary, and I give her my warm congratulations. Finally, Judy of Bebe Love Okazu gave me the Versatile Blogger Award. Judy’s posts are such a joy to read that I feel like I’ve known her for a long time. Her tone is always friendly and warm and I’ve thoroughly enjoyed learning about Japanese cuisine through her posts (not to mention her entertaining updates on the Lakers/Celtics battle during the NBA finals accompanied by delicious posts celebrating the wins of her favorite team). I’ve always wanted to learn to fly an airplane but I’m intimidated about taking my first solo flight. I’ve gone as far as picking up the book so I can study for the written portion of the exam. My husband who is a licensed private pilot is very encouraging about my ability to become one myself. I’ve been his “co-pilot” for 10 years and we’ve had some great adventures flying parts of the West. Going back to flying, one of the most unforgettable experiences we had was during one of these adventures. While flying over the desert in a little Cessna, two fighter jets flying directly in front of us tipped their wings to acknowledge our presence before zooming away. Hands down one of the coolest things ever! Just for kicks, one of my friends and I signed up for a motorcycle class last year. We were the only girls in the class. While she was able to ride a real motorcycle, I actually learned on a scooter because I couldn’t manage the weight of the former. I did earn a California Motorcycle license but I haven’t ridden a motorized two-wheeler since. I love clothes and like many women, I think my closet isn’t big enough. I have a similar obsession with shoes and handbags. I’ve always secretly wished I could sing. One of the most important things in my life is my Christian faith, although I don’t use that as a license to be judgmental of others who don’t share my beliefs. I could go on with my list but I’ll stop here for now. 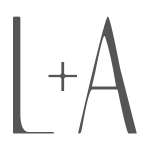 Check them out and you’ll see why I enjoy reading their blogs so much. What a great list of blogs…and what a delicious sounding sorbet. And I secretly wish I could sing too. Thanks for sharing! Congratulations on the well-deserved awards! And what a beautiful sorbet – to think that something so simple can be so sweet and perfect! I will definitely add this to my must-try list (getting rather lengthy, I’m afraid, but thankfully, chocolate creeps its way to the top!). First off, I want to congratulate you for the 3 fabulous awards your have received. Your blog is INCREDIBLY beautiful and real. You deserve it 100%. You are being you and that’s why we come back often. Secondly, this world is too awesome to only have one favorite thing or even one favorite sorbet. I hope we are allowed to have more than one favorite item in life. Last but not least, you are too sweet and kind to include me in your list. I want to run where you are right now and give you a hug. I had a rough day today and this ultimately turned my day around. I am very honored and humbled. You are a dear person and I look forward to more fabulous posts to read on your blog. Mmm, I’m on a sorbet kick as well and this just got added to my “to make” list..
Congratulations on all your awards! It is always nice to know your loved in the blog world! 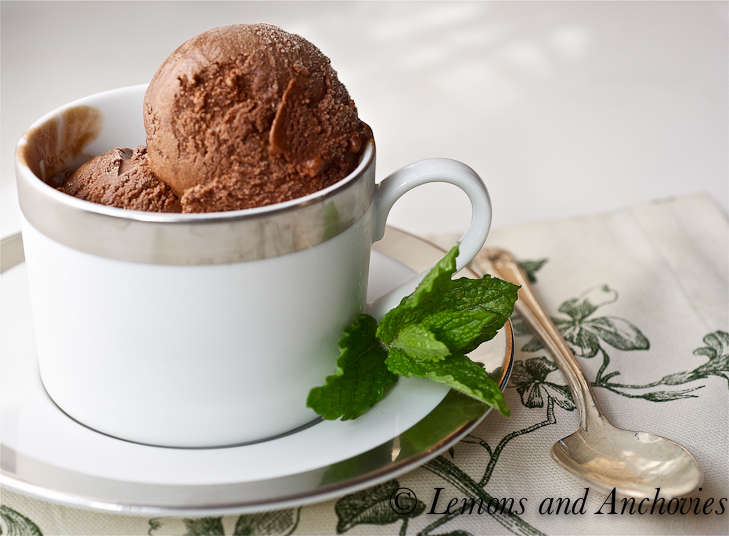 And that Chocolate Sorbet looks amazing! Your photo is spectacular! The chocolate sorbet looks so incredibly delicious. Thanks for sharing a bit about yourself. My husband has been a private pilot for a long time and is his passion. I have been a co-pilot for the last 13 years. I had wanted to take lessons for sometime and you have done much more than me. I think that I am going to take the “pinch hitter” course for safety reasons to begin with. Great post!! Thank you for the nice note today and for the award! Super thoughtful of you. Congrats on your awards!!! What a great food community out there! I can relate to the “it’s my favorite” phrase, except I tend to say “it’s simple” way too lightly. I was called on it by my friend who proclaimed not everything can be “simple” in the kitchen. Little does she know! Anyway, this looks like a great sorbet, and definitely worthy of being a favorite! Jessie, I think I might do that here, too, but I’m with you–a lot of dishes can be simple! I am so honored, and flattered, and thrilled, and hooray! Hooray! I’m blushing, can’t believe that somebody as talented with you, in the kitchen and with the lens, would give my little blog a shout out! By the way, Lauren’s Little Kitchen is doing nothing but cutting up apples, spreading peanut butter on wheat, and transferring plain yogurt from a big container to a smaller, reusable one. Which, in so many words, means I have a job. But don’t worry, I’m gonna make it work! In the meantime, you will have to blog twice as often to fill my void. Thanks! Lauren, congrats on our job. Keep us posted on your page with your new kitchen adventures! 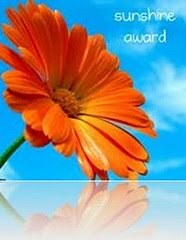 Congratulations, Jean on your blog awards!! It always feels great whenever your peers notice how much hard work you put in your lovely posts, like this chocolate sorbet, which looks so tasty!. It’s very cool also that we get to learn more about each other through our blogs. Thanks for sharing more about yourself. Dennis also is (or rather was since he has to renew it) a licensed pilot. One of my dreams is for us to fly a private plane somewhere in Europe. Or maybe somewhere here in California, even! Some day! I’m excited to hear that you and your husband fly together and that you’re his co-pilot. That’s very cool!! And by the way, thank you for the blog mention! Have a great rest of the week! Whoops, forgot to say congratulations on your awards! What a wonderful post! 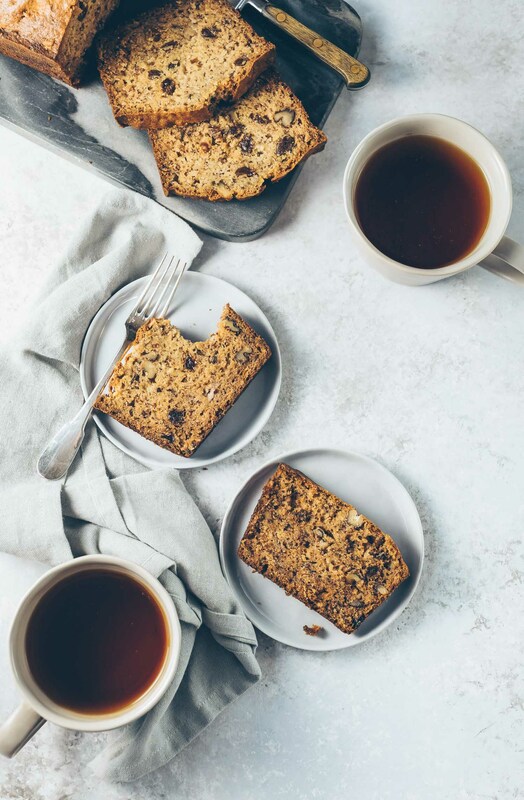 We discovered a very similar recipe years ago when my daughter was allergic to dairy and this quickly became one of our favorites. I passed my ground school and have 4 flight hours myself! My husband was one of those fighter pilots and now flies commercially. He was a wonderful teacher but that whole 4th dimension just doesn’t make sense to me, so I have now given over the flying to him. Keep working at it! I’m looking forward to the day you post about your solo! 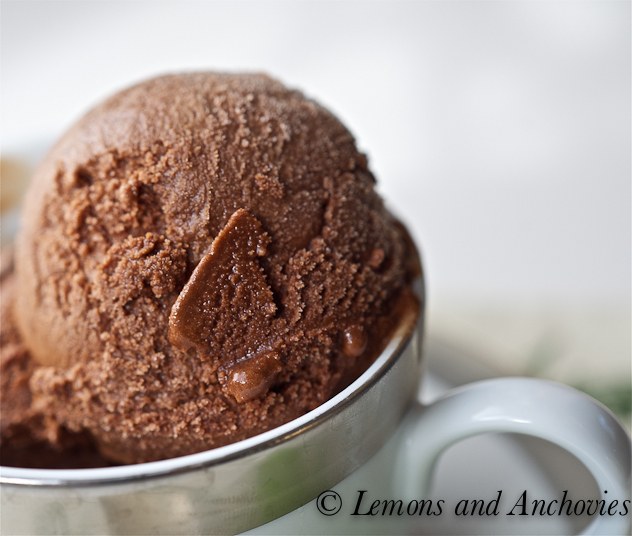 Mmmm, chocolate sorbet, great list of blogs! Hi Jean, Congrats ! All your awards are so well deserved! Thank you for the kind words. 🙂 I have tons of “favorites” and some of them do change when it is replaced by a new favorite. I think you’ll do great on your solo flight and I’m sure you’d pass the pilot exam easily. 🙂 I once had “learn to fly” on my bucket list but I crossed it off as my fear of heights is too great! We definitely share a love for clothes and I feel your pain about the closet. I assume we share a love of shopping (for clothes). Heh. Beautiful sorbet – what a fabulous way to celebrate! Yes, shopping for clothes, and shoes and bags. Oy! Just a beauty!!! So well written. Congrats. What a gorgeous sorbet! actually I prefer chocolate sorbet than regular chocolate ice cream, I think the chocolate flavor tastes more “pure”. Yours looks particularly delicious and creamy. As for motorcycles, I have always wanted to get my license, but I am not a great driver, so I have been advised that I should stick to the 4 wheels! Congrats on your awards! you did pick a great list of blog for distribution! I think you’re right about the chocolate flavor more pure in sorbets–I can see that now. I was very surprised at how creamy this turned out and of course, very happy! First: um yum. I love me some chocolate sorbert. Lovely sorbet, and yes everything is my favorite too, hehe. Loved reading the little tidbits about yourself! 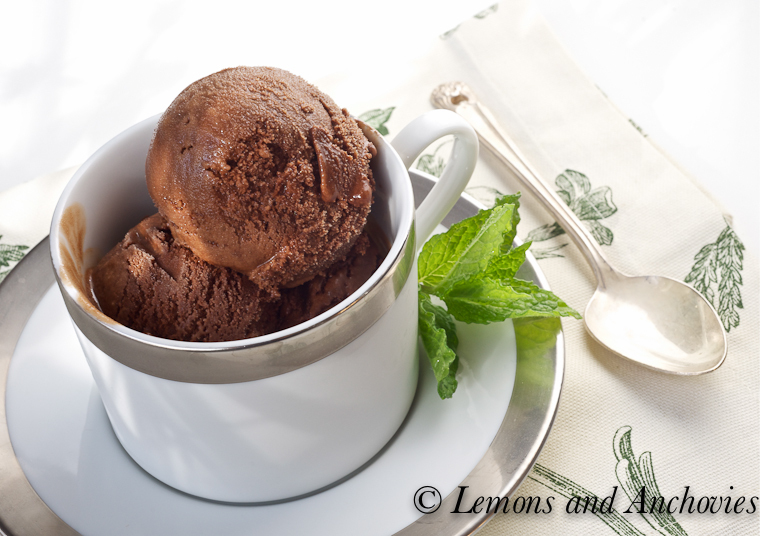 This bittersweet chocolate sorbet looks deliciously decadent and refreshing. Your photography is edible. You’ve given me a kick in the pants to start using my ice cream maker! A wonderful looking sorbet! How do you think it’d do with a little lavender in there? Lovely award! I love the sounds, and simplicity of this sorbet! We read and drool over many of the same blogs 🙂 How exciting that you’ve been honored by other foodie bloggers – it truly is a wonderful community that I’m happy to be discovering myself. Bebe Loves Okazu also gave me an award and I need to share my tidbits! Bittersweet chocolate will always be a favorite of mine – even tho I’ve seen so many unique ice cream and sorbet flavors recently. Congratulations on your blog awards! They are definitely well deserved 🙂 I also have a weakness for shoes and handbags and wish my closet were bigger!